Opus Ten is a dining experience built on trust. This is a trust that chef David Turin has earned from his customers after over 20 years of operation in Portland. The experience is designed to be completely effortless, rewarding those who allow themselves to let go and enjoy an orchestrated and appropriately portioned nine-course set menu with painstakingly coordinated wine pairings. 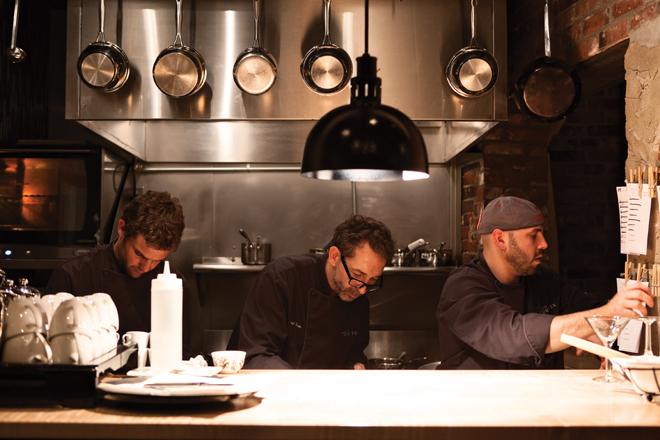 Eating at Opus Ten is about simply showing up and letting Turin do what he loves the most: cook. My faith in Turin has been justified time and time again, with every bite leaving me in excited anticipation of what may be coming next. The meal is an incredible sensory experience, with Turin’s bold signature flavors becoming even more intense in smaller presentations. The most confusing element of Opus Ten is that it is located inside of an existing restaurant, David’s Monument Square. Patrons are escorted through the bustle and hum of the dinner rush at David’s to arrive in the calm of an 18-seat dining room that sets the tone for them to relax and enjoy the show. After spending hours consulting with architectural firm Kaplan Thompson regarding what this experience should embody for both chef and guests, which Turin describes as “more like a series of therapy sessions than design brainstorming,” Turin and his team finally developed the concept. The challenge was to take what was already a very small space and center it around a functional kitchen that could fit three cooks, which would inevitably impart an element of theater for the guests. The food and service needed to be the primary focus, so the decor was to remain understated and streamlined. As guests are seated and the kitchen whirs into motion, the first portion of service is performed tableside: a cocktail is cobbled together from the various elements of the drink cart. This selection rotates weekly, featuring such creations as the Smoky Apple, which combines Bulleit Rye, Liberty apples, lapsang souchong tea, and sweet vermouth with bitters and orange zest. Once the drink situation has been seen to, a procession of “snacks” begins: serrano ham, manchego, warm olives, and crackers made from sunflower seeds, flaxseed, roasted almonds, and dried cranberries that I can’t help but compare to Nature Valley granola bars–in a good way. As preparations for the first course begin, servers deftly change out stemware to accommodate the style of wine being poured. The pairing process is a collaboration between Turin and his front-of-the-house captains, involving a good deal of rethinking when an obvious choice is less perfect than they would prefer it to be. Wines, as well as the occasional beer or sake, are not restricted to any particular region of the world, and no varietal is too obscure for consideration. Of course, the full wine list is available regardless of whether or not one opts for the chosen pairings. Alhough the menu is in constant rotation, dishes revolve around a central theme that I feel is best described as “sensual.” An earthy morel and chanterelle mushroom gratin, not unlike a bite-sized deep-dish pizza, is served alongside a luscious, impossibly rich Madeira cream shooter, layered up with foam so that it resembles a perfect cappuccino. The brisk acidity of the Schloss Gobelsburg Grüner Veltliner “Gobelsburger” lances through the density of the dish, offering notes of lemon, pepper, and the faintest hint of celery. Later in the progression, the delicate char on a grilled half of quail imparts a smoky flavor to a salty, decadent slab of foie gras served atop a small round of wheat rye baguette cooked in duck fat and honey, scattered with dried-cranberry preserve. The plum, fig, leather, and chocolate notes of the Zonin Valpolicella Ripasso manage to somehow heighten and accentuate what was already perfect to begin with. Turin makes occasional appearances on the floor throughout the meal, at one point showing up at our table to pour frozen basil-infused vodka directly onto my raspberry and apple sorbet, elevating the dish from palate cleanser to frosty libation. It is apparent that Turin is having a really good time, chatting up guests between administering spirits. All you have to do is let go, relax, and trust David Turin. You will be happy that you did.